This is only a square with a pair of snaps. It's too easy but I write here a little bit of tutorial. Please try it! You need only a pattern of 10 inches square. This pattern includes 0.5 inches allowance. And you need two pieces of fabrics as the pattern. It would be better if you have two different fabrics. 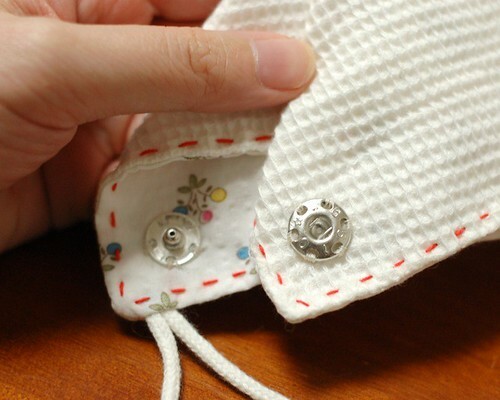 Then sew them together leaving an opening to turn it out. I sewed it with half back stitch to make it sturdy. 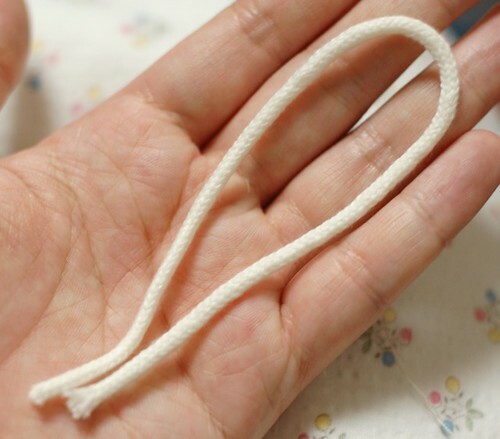 At a corner, I put a piece of cotton string (4 inches length). 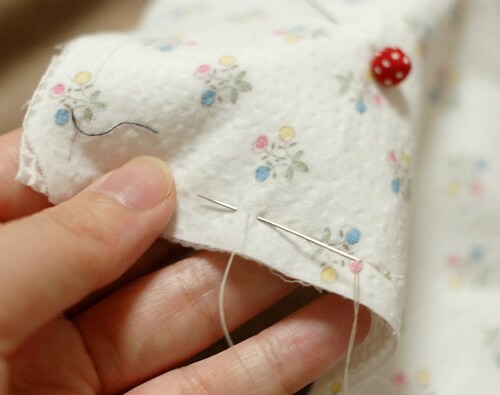 Put it like the picture and sew it again and again. Before turn it out, cut every corner in bias to make the corner sharp. Turn it out and close the opening. 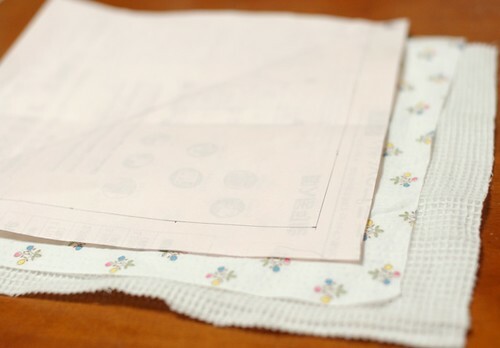 I hand stitched with Sashiko embroidery thread to decorate it. Put a pair of snaps (or velcro) at the corner with the string and the opposing corner. It's all! You can use it reversible. 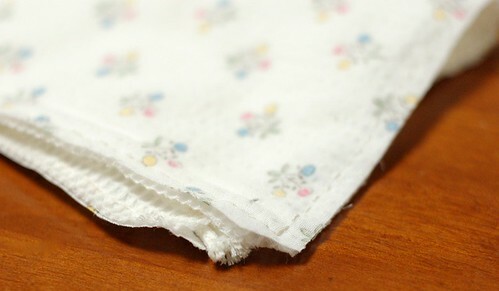 And you can use it as a hanky too. I made two of them and today sent them to my sister. These are for her second baby. I also made a pair of slippers for her first girl, my little niece, with her favorite character. 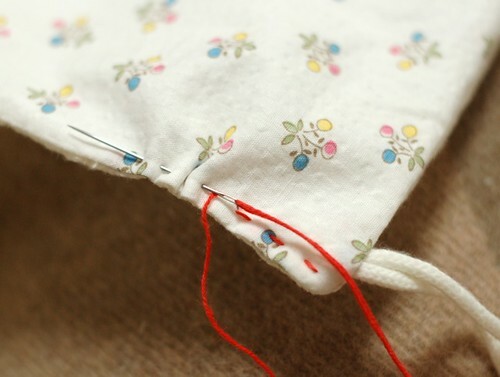 These days I'm pretty good in the morning so I can sew for several hours. 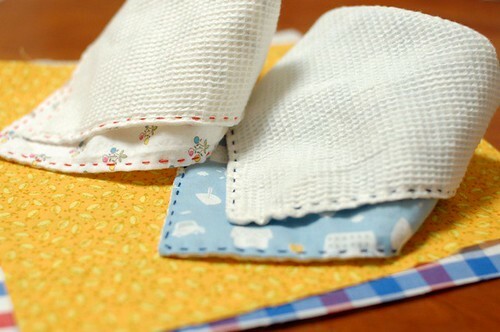 I'm not so good in the evening but sewing time makes me happier than before (* v *). Thank you very much for your comments. I like reading them to my Tomato. These bibs are so lovely again. I love the fabrics you choose. 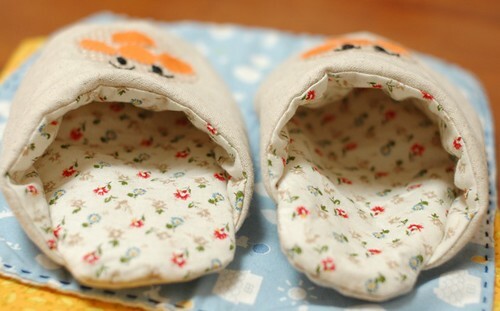 Especially the inside of the little slippers, gorgeous! Congratulations with your sister's baby! 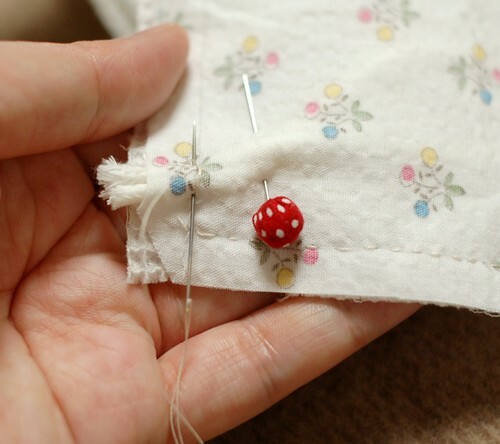 Your stitching projects are always so lovely!! This little bib is no exception! These are lovely. I especially love your pins--so fun. Thank you for sharing your work. These bibs are wonderful! Thank you for the tutorial! And those slippers are simply adorable! Will you please please please give us a tutorial on how to make those? P.S. Dear tomato, you are so lucky have such a talented mom! the anpanman is very kawaii!!! thank you very much for your tutorial! !..and take care! i am so happy for you and you family!!!! yesterday night i went to the hospital with my friend and she had her babies!!! !A boy and a girl!! !i was so lucky to be there and see the babies when they came out of the room!! !there are so cute!!!! i am going to make some of the tutorials for the babies!!!! I am so happy you are feeling better right now, my friend wasn't feeling quite good the firsts two months of her pregnacy but then she could do normal life and even work for a few months!!! Hi Mairuru... congratulations for your new baby (tomato?). I will be so happy for your visit. It's beautiful what you do. I will be happy to have your visit. dear may the slippers you made are uniqe and very lovely !she is going to love them for sure i did ! keep enjoing your mornings ,kiss for growing tommato . 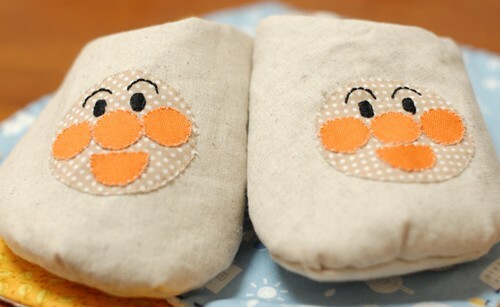 i love the anpanman slippers. can you make a tutorial for the slippers. I want to make myself one for the house. I remember when my husband ask me if I wanted to have a baby,, but I knew we had a problem, so we buy viagra after to prove all the benefits this medicine can give us. like a couples we talk everything, and now we finally have our kids. 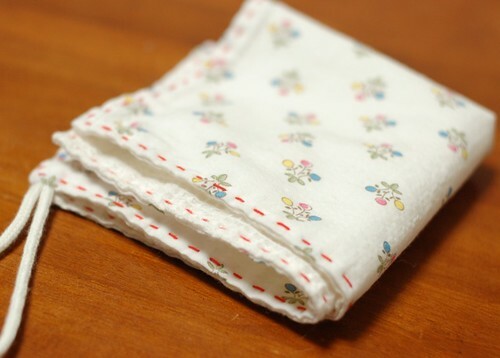 The last baby have a lot of blanked that my husband buy for him. I think he doesn´t know how to say happy he is in this moment. Wow! That is some great work. You got to admire the hardwork they exert to build that structure - not to mention how they used a very old technique of using mud. I want to start by telling you that you have to be a very dedicated person with a full driving force to Websites for sale present in detail the program that you did. It was a great session and beautifully presented Turnkey Websites . Again, thank you for your presentation and my undying respect. I feel strongly about information and love learning more on this. If possible, as you gain expertise, It is extremely helpful for me. would you mind updating your blog with more information? 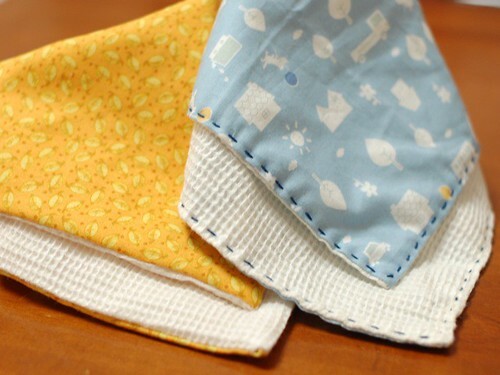 Wow, superb square baby bibs.. i loved it.. Also, you taught how to make it.. Great work guys, keep it up, always encourage your posts..
What a very nice tutorial and not just that this is also useful. I've Been around searching for some tutorials but I can't find the easiest one that can be followed easily. 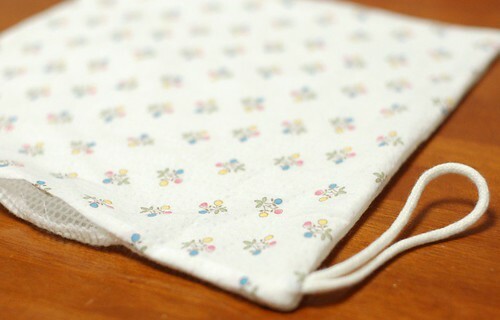 I love the simplicity that goes around In the baby bib of yours. Thanks for this great information! What I made first for my tomato.